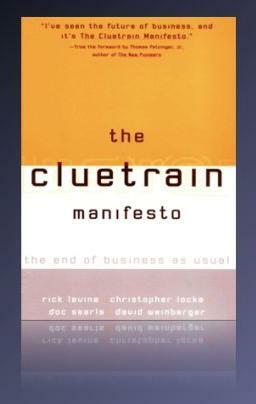 The Cluetrain Manifesto actualy started the Revolution in the field of modern marketing and business in general, provokoed the big change which came with the powerful development of the Internet and Digital technologies. It began as a Cluetrain website in 1999 when the authors - Rick Levine, Christopher Locke, Doc Searls, and David Weinberger, who have worked variously at IBM, Sun Microsystems, the Linux Journal, and NPR, posted 95 theses about the new reality of the networked marketplace. Twelve years after its original publication, their message remains more relevant than ever. For example, thesis no. 2: “Markets consist of human beings, not demographic sectors”; thesis no. 20: “Companies need to realize their markets are often laughing. At them.” The book enlarges on these themes through dozens of stories and observations about business in America and how the Internet will continue to change it all. The ideas put forward within the manifesto aim to examine the impact of the Internet on both markets (consumers) and organizations. In addition, as both consumers and organizations are able to utilize the Internet and Intranets to establish a previously unavailable level of communication both within and between these two groups, the manifesto suggests that changes will be required from organizations as they respond to the new marketplace environment.